In 1976, millions of people saw Network and laughed bitterly at its exaggerated, satirical story of a TV news department’s quest for ratings. In 2016, you watch the movie and realize it’s not a satire anymore. Every outrageous thing it predicts has happened. 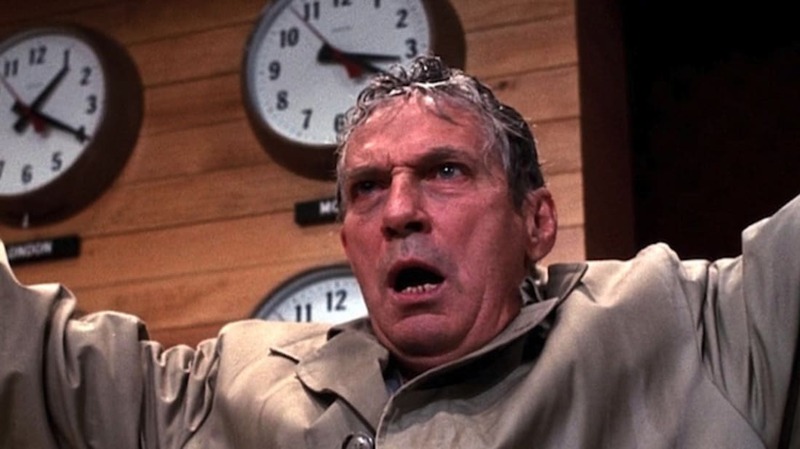 Was screenwriter Paddy Chayefsky a prophet? Did director Sidney Lumet have a crystal ball? Probably not. At any rate, never mind how mad you are, sit down and take these behind-the-scenes details about one of Hollywood’s most timeless satires, which was released 40 years ago today. 1. THE MOVIE GETS LIGHTER AS IT GETS DARKER (IN A MANNER OF SPEAKING). On the DVD commentary, director Sidney Lumet points out a strategy that he and cinematographer Owen Roizman used to subtly underscore the movie’s themes. In the beginning, scenes that require anything more than natural light get only the bare minimum: dim lights in a barroom, for example. That’s to emphasize the news being independent, unconcerned about beauty, not “showy.” But as the characters become corrupted, we see more and more artificial lighting, as if the movie itself is becoming vain about its appearance. “Even the camera got corrupted as the movie went on,” Lumet said. 2. PETER FINCH GOT THE PART BY READING A NEWSPAPER. Lumet was convinced he needed an American actor to play the unhinged TV news anchor. Peter Finch, though a fine actor, was inconveniently British. To prove to Lumet that he could get the accent right, he recorded himself reading an entire issue of The New York Times. 3. THEY USED A REAL TV STATION FOR THE NEWS SEQUENCES—IN CANADA. 4. SHOOTING ON LOCATION MEANT THEY HAD TO FAKE SOME RAIN. The network offices in the film were real upper-floor offices in a Manhattan skyscraper. The un-fakeable view of a real city outside the windows gave the movie authenticity ... but it also meant the weather in the movie was dictated by the weather in real life. That’s why there’s a scene where we see Howard Beale walking in the rain and entering the UBS building soaking wet: it had been raining days earlier when they filmed an office scene that took place right before this one, so they had to use rain machines to make it match. 5. IT RESULTED IN THE FIRST POSTHUMOUS OSCAR FOR A PERFORMER. 6. IT ALSO GAVE US THE SHORTEST OSCAR-WINNING PERFORMANCE. Beatrice Straight, who plays William Holden’s wife, won the Academy Award for Best Supporting Actress despite appearing onscreen for barely five minutes, almost all of which is in one (very good) scene. Shorter performances have been nominated, but she holds the record among winners. 7. THE WRITER’S IDEAL CAST INCLUDED WALTER MATTHAU, CANDICE BERGEN, AND CARY GRANT. Paddy Chayefsky’s notes indicated his dream choices, with a few candidates for each major role. As Schumacher, eventually played by William Holden, Chayefsky envisioned Walter Matthau or Gene Hackman. In the Faye Dunaway role, he liked Candice Bergen, Ellen Burstyn, or Natalie Wood. And as the ranting TV newsman Howard Beale (played by Peter Finch), he wanted Cary Grant, Henry Fonda, James Stewart, or Paul Newman (to whom he wrote a letter telling him he was one of “a very small handful of actors” he thought were right for the part). 8. THERE WERE PROMOTIONAL BUMPER STICKERS. An R-rated adult satire of TV news doesn’t sound like the sort of movie that would have promotional bumper stickers, but Network did. They read “I’m mad as hell and I’m not going to take this anymore,” and MGM distributed 80,000 of them. 9. WALTER CRONKITE’S DAUGHTER IS IN IT. Kathy Cronkite, whose father is mentioned by name in the film and could be considered one of its satirical targets, plays Mary Ann Gifford, the Patty Hearst-like revolutionary figure that Faye Dunaway wants to make a reality show about. Ms. Cronkite had done some acting, with small roles in a couple of films, but the added irony of casting her in Network undoubtedly helped Lumet make the decision. 10. THE DIRECTOR TOLD FAYE DUNAWAY TO VIOLATE A BASIC RULE OF ACTING. Lumet hadn’t worked with Dunaway before, but he knew she was a dedicated perfectionist (to use one of the politer terms people have used to describe working with her). She’d want to dive deep into the character of Diana Christensen and really understand what makes her tick. Lumet headed her off at the pass. When they met to discuss it, he said, “I know the first thing you’re going to ask me. ‘Where’s her vulnerability?’ Don’t ask it. She has none. If you try to sneak it in, I’ll get rid of it in the editing room.” Dunaway understood what Lumet wanted: as a satirical figure, it was OK if Diana wasn’t quite realistically human. 11. DUNAWAY AND HOLDEN HAD WORKED TOGETHER BEFORE—AND DIDN’T LIKE THE EXPERIENCE.